Outside of Japan, probably no other country has more Japanese restaurants per capita than Singapore. There is no lack of options if you wish to have a bowl of ramen. 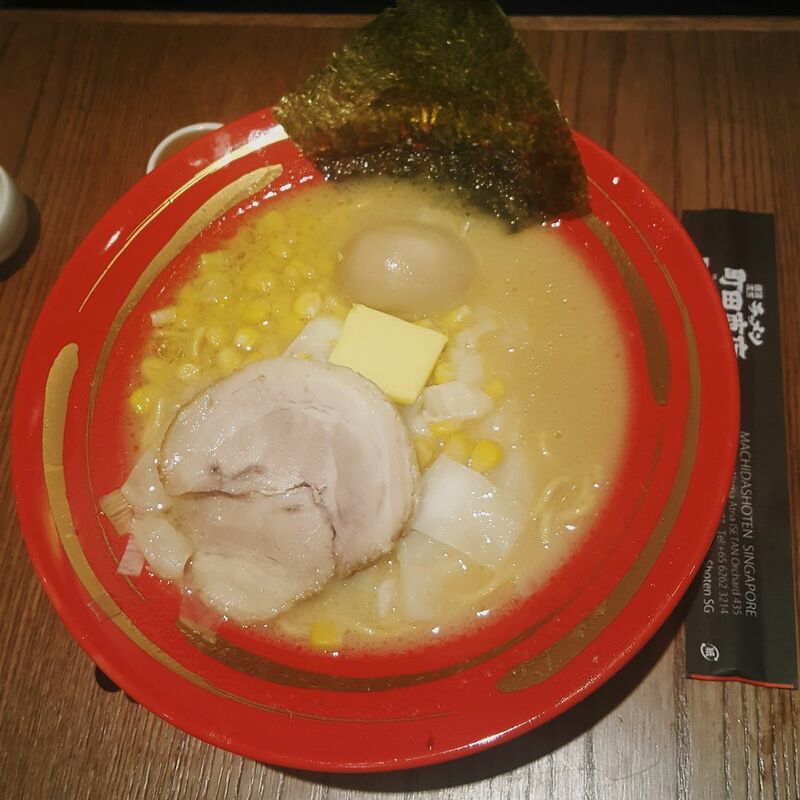 So why should you make your way to Machida Shoten, a ramen eatery that recently opened in Wisma Atria Japan Food Town? Here are two reasons. 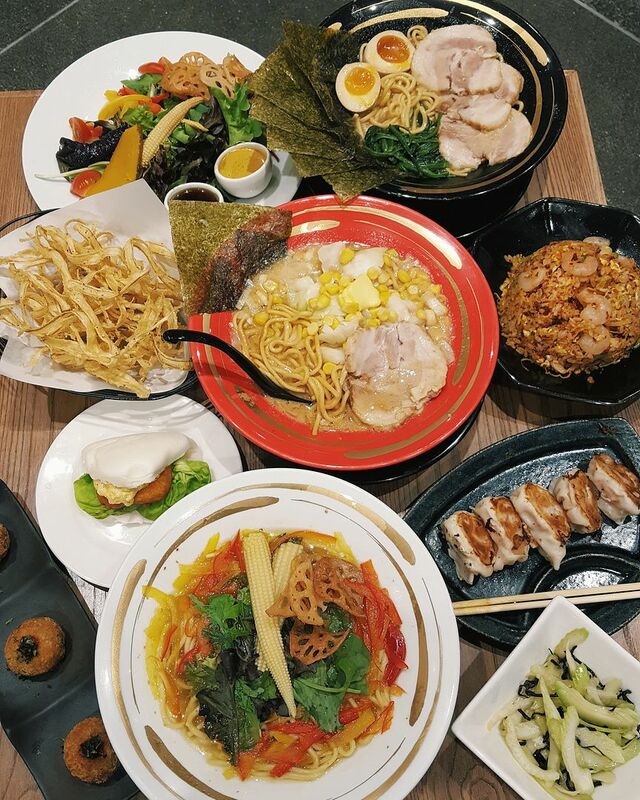 You may discover more if you heed my advice and make a visit, which you should the next time you crave a bowl of ramen or a good, inexpensive and fuss-free Japanese meal. It may come as a surprise that quite a few places in town that claim to be ramen restaurants are not very good at it. Machida Shoten, on the other hand, does a great job. It uses thick yellow noodles, different from the thin stringy version that is more common here. The ramen is not overly heavy or starchy, and acts as an excellent conduit for the broth, which is the star of the show. You should either order the Shoyu Tonkotsu Ramen ($16) or the Miso Tonkotsu Ramen ($16). The Shoyu Tonkotsu broth is an intense mix of pork bone and shoyu flavours which engulf your senses at once – it is rich, robust, nutty, and many delicious things combined into a wonderful whole. You are forced to shut out all distractions to confront this bowl of ramen, and the reward is utter satisfaction and happiness. The Miso Tonkotsu broth is no less flavorful, bringing together the light, sweet aroma of white miso and the deeper, more exciting umami of red miso. The ramen is served with a slice of butter, which when melted into the soup works brilliantly to give it a hint of salted caramel. Very satisfying, very happy. 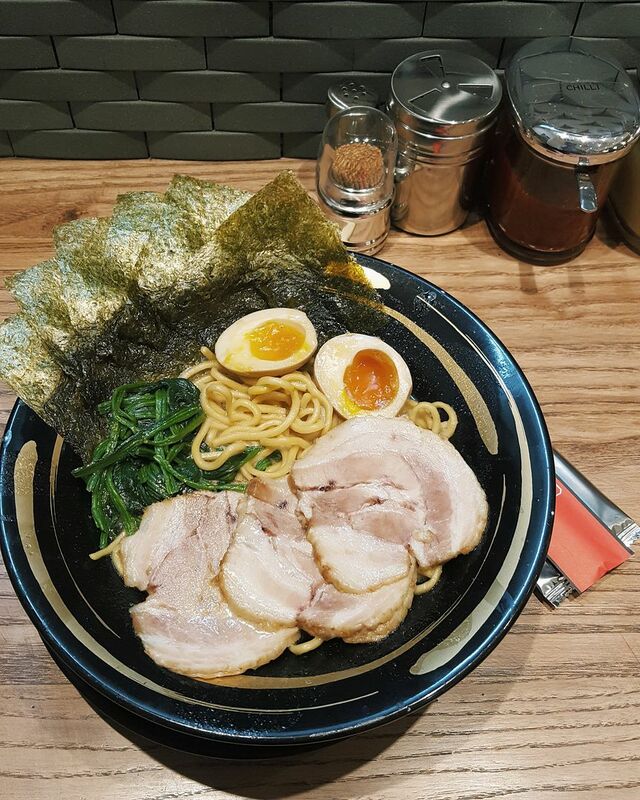 Each bowl of ramen comes brimming with vegetables, thick slices of pork char-siew and cooked-to-golden-perfection marinated egg. You can choose from three levels of doneness for the noodles. Altogether, it makes for a serious bowl of top-notch ramen, prepared by a restaurant that obviously takes a lot of pride in its ramen. Machida Shoten is apparently well-known in Japan for its iekei ramen, which means “home” in Japanese. 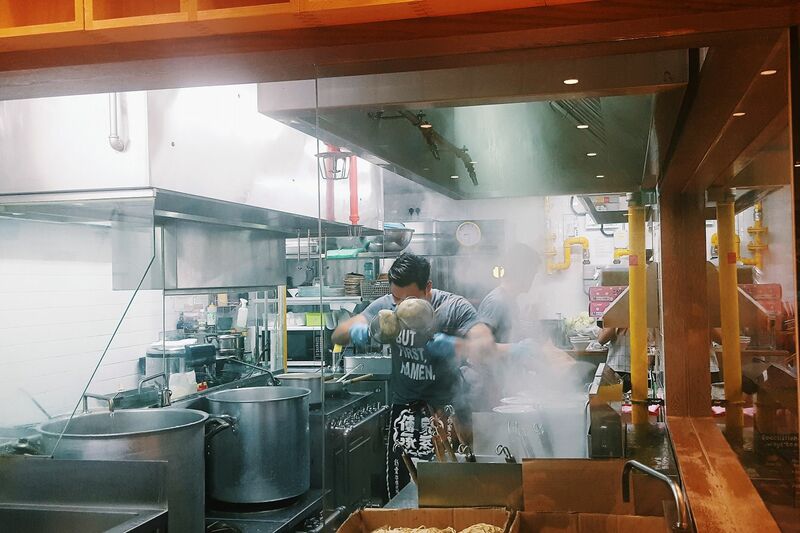 The restaurant aims to create feelings of warmth and home through its ramen, which is certainly very comforting and hearty. I suggest that you visit the restaurant when you are feeling particularly hungry and nursing a big appetite. You should complete the meal with at least one side dish, because Machida Shoten executes them well. 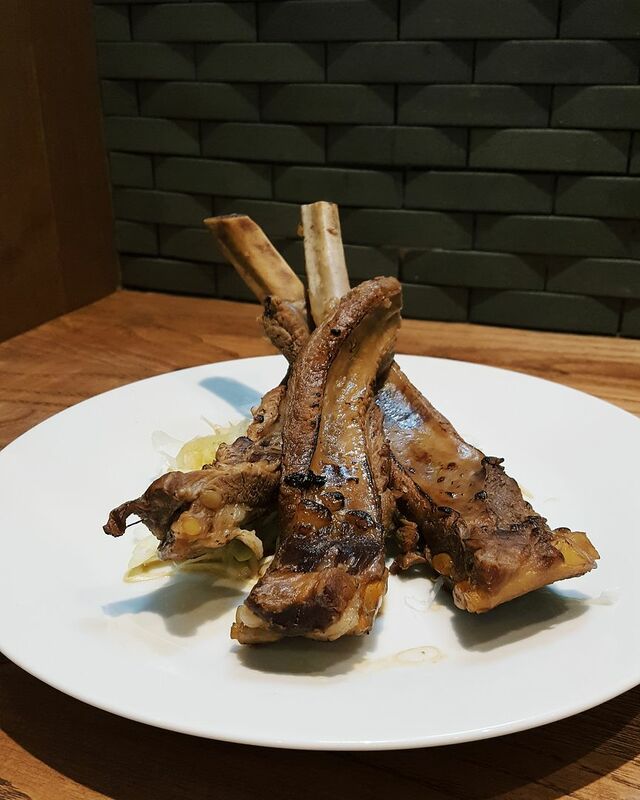 My favourite is the Seasoned Iberico Spare Ribs ($14), 3 proper, long pieces of spare ribs done flawlessly – tender enough to remove the meat from the bone, but not so soft that you feel like you are eating jelly. There is a good mix of juicy meat, pork fats and soft-bone cartilage. The pork itself tastes fantastic and is clearly of high quality; it is complemented well with a sweet soya sauce that is created in-house. Another side dish that you should leave room for is the Shrimp Gyoza ($9.80 for 5 pieces), which consists of minced shrimp wrapped around an entire shrimp. No chives, no pork, nothing else, just a celebration of sweet, fresh shrimps. It is not a heavy dish and goes well with the more intense ramen broth. It may, however, be quite bland if shrimp gyoza is the only thing you are ordering. Aside from these, Machida Shoten also offers other side dishes, such as the Char Siew Croquette ($6) and the Fried Shrimp Bun ($5). 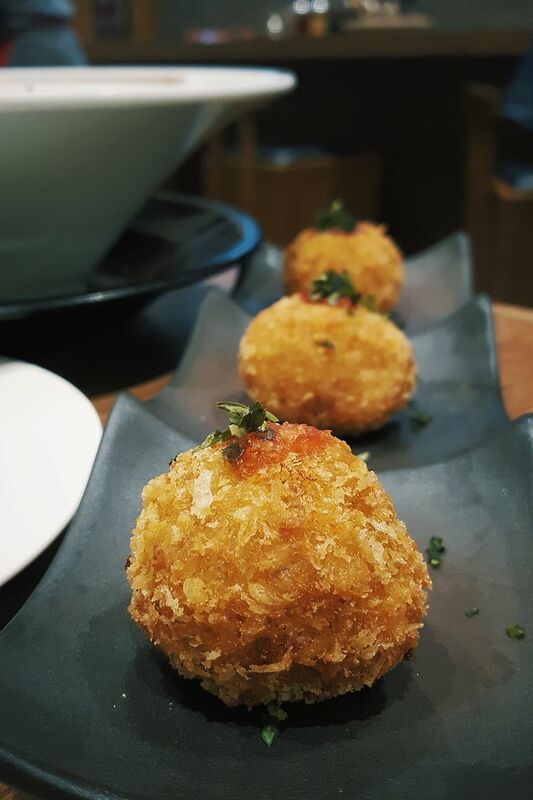 The former is a minced char siew pork ball with a crunchy croquette exterior – good but definitely with room for improvement; I would have preferred chunkier and juicier char siew filling. The latter is a piece of shrimp croquette stuffed into a mantou bun, with an egg sauce. I find the flavours to be quite underwhelming, and the bun-shrimp ratio a tad too high. Overall, Machida Shoten does a great job of providing very good food at a very reasonable price point. There are many good Japanese restaurants in town, and at times, happily, we are spoilt for choice. But if all you want is just a good bowl of ramen, or a pleasant, simple Japanese meal – with a cold beer perhaps, you will be satisfied and happy at Machida Shoten.